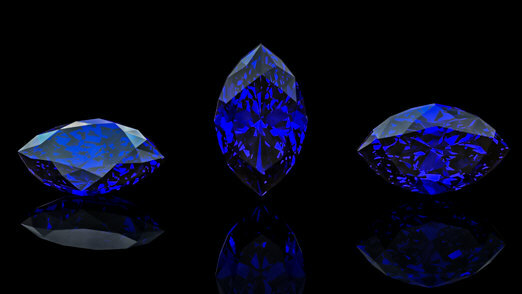 Tanzanite is the birthstone for December and the Gem for the twenty-fourth wedding anniversary. 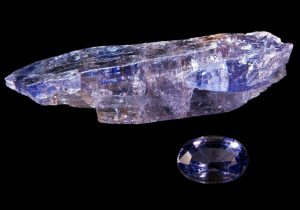 Its tormented story began quite recently, in 1967 in Merelani, northern Tanzania, when a member of a Maasai tribe tripped over a cluster of highly transparent, intense blue crystals. The naive Maasai shared his find with Manuel D’Souza, one of the fortune hunters in the area. Manuel was in search for Sapphires near Mount Kilimanjaro, about 90 km from the town of Arusha, and immediately mistook those crystals for blue variety of Corundum, Sapphire. But, in fact, what he discovered was not a Sapphire, but Tanzanite. Those rare and fascinating crystals showed so wonderful color that Manuel immediately asked Tanzanian government for permission to excavate. And what was remaining to Masaai who first found the Gem? Only glory. The discovery stirred the gemological world. The Gem was identified as a variety of Zoisite consisting mainly of Silica, Calcium and Aluminum. Zoisite was a mineral known for about two hundred years. It was first identified by the Austrian scientist Siegmund Zois Edelstein who found it in Karinzia. But the discovery of Zoisite did not have the effects that the finding of the Tanzanite had. In fact, after the fortuitous discovery of the Masai, hundreds of miners crowded the area of 20 square kilometers. Because of the momentary initial chaos much rough gems were immediately stolen at a lower level. The pleochroism of this Gem forces the cutter to save as much weight as possible. At the same time, the cut must bring out the best color of the Gem when it is viewed frontally face-up. Cutting a tanzanite to emphasize the bluish purple color usually wastes less rough than cutting it to get a pure blue or violetish blue color: for this reason the market is full of bluish purple Tanzanites. But when the Gem can show an absolutely desirable color, the cutter prefers to sacrifice the weight and emphasize purplish blue color. 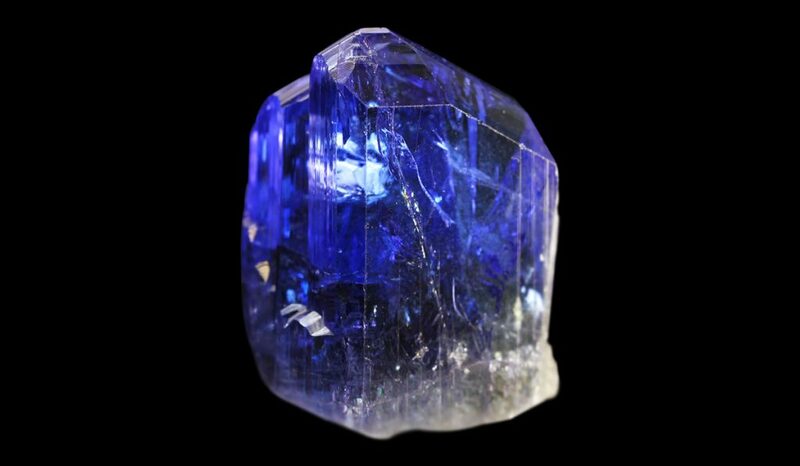 On the Mohs hardness scale Tanzanite ranges from 6 to 7. This gemstone has perfect cleavage in one direction and is very sensitive to thermal shock. For this reason it could be worn with proper precautions against rough wearing, and should never been washed in the ultrasonic machine. Many of the largest and most fascinating stones are found in museums and private collections. Returning to the history of Tanzanite, we must point out that Tiffany’s advertising campaign in 1968 made prices to rocket sky-high, especially due to the lack of Sapphires. It was Henry Platt of Tiffany who gave Tanzanite its exotic name and contributed to the great success of the advertising campaign launched by one of the coolest companies in the world! In 1971 the Tanzanian government took over the mining operations and imposed a marked reduction in supply. So the prices went very high. All this led to an inevitable stagnation in the Tanzanite market. In 1980 an incredible event happened: the Tanzanian government lost control of the mine. Immediately thousands of miners resumed their search for Platt’s beloved Stone. But in 1988 a catastrophic flood occurred, and more than 100 miners died by drowning. The tragedy could be predicted long time before considering the primitive working conditions of miners. Fortunately, today the situation has stabilized. The largest faceted Tanzanite Gemstone of a marvelous color weighing 122.74 carats, and an ultra-rare 18.2 carat cat’s eye Tanzanite, located in the Smithsonian Institution, are the most remarkable members of the Tanzanite family.